I'm posting this here in hope that it helps other people facing the same issue. This week-end, my Korg Krome synth's display became blank again. Given that it's a touch device, it becomes pretty useless once the display doesn't work anymore. It's not the first time it happens, I even disassembled it once hoping it was only a cable or solder issue, but it worked again after being reassembled for no apparent reason. I noticed that often after it failed, it would re-appear after a few hours/days, and sometimes it would disappear again. I thought the LCD was dead. I ordered a new one on the net (almost any 7" 50-pin LCD with a resolution of 800x480 and about 15cm of cable will work). It cost me $15, it worked and failed again after one week. Finally I disassembled the Krome again and observed the LCD power board, and found that the LCD reset pin (44) had a strange voltage of 1.5V instead of 3.3V. The reason is a design error in the choice of resistor R28. It's 10K while it should be around 1K. With 10K it doesn't have enough strength to completely release the reset and it depends on the LCD's tolerance (which probably changes with aging). I simply soldered a 1K resistor on top of it, verified that the voltage on the reset pin is now 3.3V, and the problem is now fixed. 2) remove all screws on the back. There are a lot, something like 37. Important : there's no hidden screw, so it's not needed to remove the rubber feet. 3) gently pull the back vertically, it will very easily come. If it doesn't, you forgot a screw. 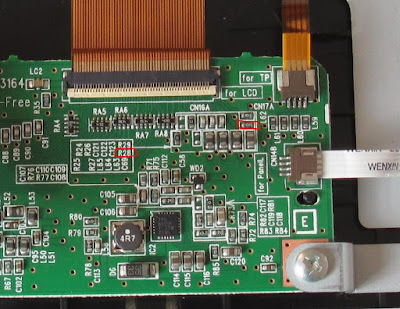 4) you'll see the mainboard at the center, close to the back where the SD card is. You'll have to remove the screw with the plastic washer, and gently pull the soft plastified tin foil which protects against radio emissions I guess. 5) then remove all cables going to the motherboard (no risk to confuse them later, though it's better to take a photo). In order to remove the flat ribbon at the bottom, you first need to pull the brown part of the connector outwards to unlock it (do not force, it will come by alternatively pulling each extremity with your nail). 6) remove the 6 screws from the motherboard, then take the motherboard out of the system. 7) remove the metal frame that supported the motherboard. 6 screws again IIRC. It is not strictly necessary to remove the board to fix it but it's better as static electricity could destroy the LCD. The large flat cable at the top goes to the LCD. The small one on the top right is for the touch pad. The other small one at the bottom right goes to the audio board on the right. 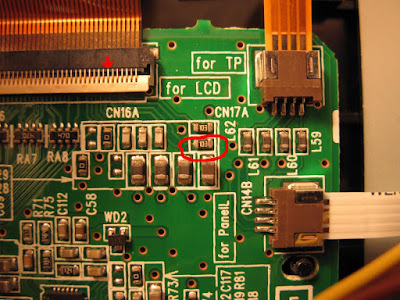 In order to remove the LCD cable, you first need to pull the white part of the connector upwards to unlock it (do not force, it will come by pulling with your nail). The other ones need to be pulled in their own direction without bending them. 9) remove the 2 screws holding the board, and slightly unscrew the 4 other ones holding the metal frame so that you can get about 2-3 mm of clearance. That will be enough to release the board from the 2 plastic tips which hold it. 11) DO NOT REMOVE IT! It's a small component, if you're not at ease with soldering small components, you'll certainly destroy the board by pulling off a copper lane. Instead, just find a 1 to 2k resistor on another unused board such as a dead motherboard. Such a resistor is marked 102 to 222. Note that the first two digits are less important than the 3rd one which is critical (exponent). It MUST in fact exactly be "10" to "22" followed by a "2". If you have something smaller than a 2 on the last digit, reset will never work. If you have something larger, your fix is useless. 12) Once you've found this new resistor, directly solder it on top of R28. If you're having trouble soldering something that small, first stick it on top of the other one using some superglue then put a very small drop of solder on each side and that will be all. You must not heat it more than 1 or 2 seconds per side. The amount of tin to add is around 1mm * 1mm only. 13) verify with an ohm-meter that you have slightly below 1-2k when you measure across the previous 10k resistor. If so you did it fine. 14) reinstall the board, then tighten the metal frame's screws, screw the board, reconnect all connectors (be careful with the small ones, you don't want to bend them or they could cut). 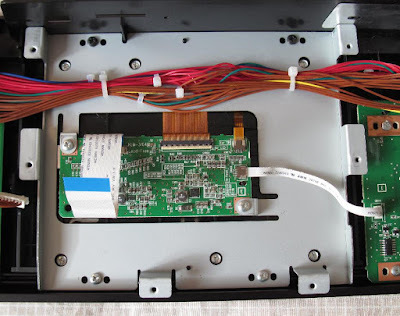 Then pass the motherboard wires that you might have moved close to the board, reinstall the top metal frame, then the motherboard, reconnect all wires and power on. It must work. Once it's OK, you can finish to reassemble everything. I noticed that black screws are used outside and grey ones are used inside, except a few holding the LCD frame and the keybed which are also black. Try not to mark your screws. A screwdriver made for PC parts is perfect and will not mark. Count around 10-15 minutes just to disassemble everything, about as much to reassemble, and as much to fix the board once you have found a suitable resistor. If you don't have a resistor, you can find one at an electronics components shop. Just go there with your board and they'll find the proper size. I guess it's a "0603" type of resistor (it indicates the size) though I'm not certain and forgot to measure. I forgot to say, I noticed that the original Krome's LCD is of very good quality. When you replace it with a cheap one, images are really ugly. But that was better than nothing. Hoping this helps other people! I've read on various forums that many other people got in trouble with the same issue and it's too bad that some repair shops take them hundreds of bucks to fix this. So do not hesitate to spread the message and to share your experience.